Everyone has 23 pair of chromosomes in there body at average. This material is located in the nucleus of the cells inside you body. 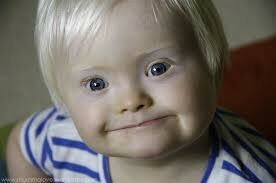 Down syndrome is a genetic chromosome 21 disorder causing developmental and intellectual delays in he/she's bodyy. 1. DS is a disease caused by a child/person being born with an extra copy of chromosome. 2. 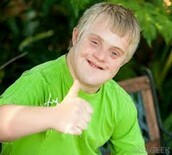 The exact cause of the extra chromosome that triggers down syndrome is unknown. 3. One in every 691 babies are born with down syndrome. 4. There are more than 400,000 people in the US with down syndrome. 5. In 1983, the average life expectancy of a person with Down syndrome was a mere 25-years-old. Today, it’s 60. 6.Children and adults with Down syndrome share some common features, but naturally the individuals will more closely resemble their immediate family members. 7. In the nineteenth century, the first accurate description was published about Down Syndrome. 8. 80% of children with Down Syndrome are born from women under the age of 35 years old. 9. The average life-span for someone with Down Syndrome is 60 years old. 10. Individuals with Down Syndrome usually have about 47 chromosomes in their body. 1. Eat meats or meat substitutes like tofu or peanut butter. 2. Lean towards having fruits and vegetables as a meal. 3. Make sure they get the correct amount of sleep. 4. Make sure their vision is checked on a daily basis. 5. Check their hearing every couple of days to make sure they can hear. Anyone can get Down Syndrome but it isn't all that common because it is a disability you get at birth. "Down Syndrome and Health - Better Health Channel." Better Health Channel. Government of Victoria, n.d. Web. 16 Mar. 2015. "What Is Down Syndrome?" - National Down Syndrome Society. N.p., n.d. Web. 11 Feb. 2015. "Protected Tomorrows - Healthy Eating Tips for Children with Down Syndrome." Protected Tomorrows - Healthy Eating Tips for Children with Down Syndrome. N.p., n.d. Web. 17 Mar. 2015.